Lambert Says Sports: Not Just Another Strawberry Picker. Not Just Another Strawberry Picker. Ever fight a Mexican? Better yet have you ever fought 2 Mexicans and 1 Cuban? Have you...? Chances are you haven't. I haven't either. They are as tough as how hard they work. Fisticuffs with a Mexican anyone? 108 wins, 6 losses and 2 draws, with 87 knockouts. Gaudy Gaudy numbers. Those are Julio Cesar Chavez professional career numbers. He went unbeaten in his first 91 matches. One of his great performances was his last second stoppage of Meldrick "The Kid" Taylor on March 17, 1990. A Brutal fight with great technical boxing. Taylor delivered a boxing lesson but took a beating he never recovered from. Chavez used Constant pressure combined with body blows and deadly hooks to beat and wear men down. The best might be yet to come from Julio. Chavez made two Carbon Copies of himself in his two sons Julio Jr. and Omar. Both kids faces became known to boxing fans when there father would take them into the ring as children, before each of Chávez Sr.'s fight. They are both showing legendary promise. One with a deadly right hook and a ring savvy, and the other with blazing speed and technique. 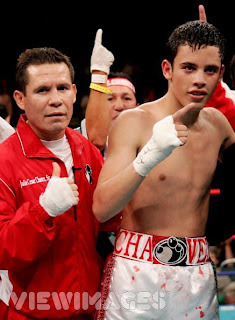 Chávez Jr. currently has a record of 36 wins, no losses and 1 draw, with 29 wins by knockout. This Kid is laying people Out. I bet he dominates the light weight division to the middleweight division for the next 8 years. He's a bigger stronger version of his Father. He's 22.